The Crown Jewel II longarm machine from Baby Lock allows you to create gorgeous and intricate quilting with an astonishingly smooth stitch for the utmost creative freedom and precision. With a generous 18″ longarm, you can achieve beautiful and professional-quality quilting with ease.Effortlessly control every aspect of your quilt with a large LCD on the front and back handles. Enjoy the satisfaction of adding the final touch with the Crown Jewel II. 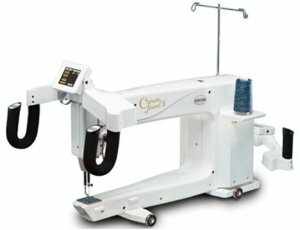 The Crown Jewel’s larger workspace allows you to stitch freely without worrying about limitations. Effortlessly control the motion of the Crown Jewel from the side of the machine that you prefer with the comfort gripped handles. Large, color LCD Display shows: Stitch Regulator and Manual modes, Multiple LED Lighting options, Memory settings, Needle speed, Stitch counters, Alarm mode, Diagnostics, Calculator. Enjoy less bobbin changes with the largest bobbins available in quilting (up to 40% more than a standard bobbin). Handle Bar Control Buttons at your fingertips: Needle Up/Down, Start/Stop, Speed Up, Speed Down. Take your quilting to the next level with QuiltMotion software, designed specifically for the Crown Jewel. You can choose, edit or even create quilt motifs on your PC, then instantly transfer your patterns to the machine and hardware for automatic quilting with flawless placement.